Heyo, just wanted to post a simple blog update related posting just stating some basic things. May be a useless blog post, or it may not be. First thing’s first, I’m painfuly exhausted. I really, truly absolutely want to keep doing figure photography related content, yet I’m just burned out that I’m constantly trying to recoup every day off I get to tend to various backlog things, and you’ve probably noticed how I struggled to keep up with Frame Arms Girl anime. I’m struggling to keep up with each festive event that it simply goes on without me. I tried to keep up with it [FA: Girls anime] on every day off, or during the nightly periods of Sundays when I had more time to myself. I believe I’ve done a well enough job on that. Yeah. Just painfully exhausted that it appears I may have been lazy in other people’s point of view when I constantly suffered with being sick in various states. In a constant state of stress, sleep deprivation, among other things, thus my cranky state of mind. Even stressing over the whole thing that no matter what I say that people shall simply see something simple as “excuses”. As of right now I currently feel I have either a fever or a cold denying me in doing things I desire in doing. I currently feel like a zombie struggling to make a coherent posting right trying to release this blog posting in case I fail to release my planned blog postings. I feel like I’m partially on fire with a fever, cold, or something. Painful exhaustion. For those that assume I’m being hostile, or aggressive I do highly apologies for any hostilities on my end. Apologies you had to be experience that. That’s the exhaustion in me speaking. I genuinely go into a state of surprise/shock when someone tells me I’ve been hostile to them, or even offended them, or something because I try to be that kind person, yet it seems to just be a fake plastic mask I seem to wear. I bothers me greatly that people believe I have offended them in any way because I always try to be nice to them, granted that’s not always the case. I try to be nice to people, yet it seems I’m not that it ends up depressing me when people label me ‘toxic’ & ‘hostile’ that I just can’t shake it. It harms me, as much as I seemed to have harmed them. Constantly fatigued, constantly stressed, sleep deprived, and such that I really should keep away from social media sites. I just simply believe that when you’re allowed to vent on Tumblr that you’re elevating the various stresses within, something I try to keep off my main blog & twitter, yet seems to still spill over into there. I’ve used Tumblr to simply vent & vent because that’s what it’s meant for. Just vent, and you’d release any pent up steam, simialar to how steam locomotives function. I even encourage people to vent because it allows them to relax. Even at my workplace people feel better after venting that when people hear them out that they feel better with themselves. They need people who relate. It also helps in Japan when people talk with one another that people feel happier when people talk with one another, something I’ve read in articles and watched in videos about Japan with how high their suicide rate is. If someone dies someone in their family foots the bill & burden of the one whom suicides causing further grief that talking is the correct way to deal with suicide. Actually relating to what they say without making what they say worthless. I’m constantly feeling like a wreck that I just generally feel I do no belong in any anime group gathering for how ‘negative’ I am, or am being, or how I’m feeling. There’s that constant state of ‘frustration’ there. Even for how horrible I feel currently I feel I won’t accomplish anything this year. Maybe next year, just not this year with how little focus I have, and etc. I just feel like an outright mess right now trying to constantly gauge what I can and can’t do. I”m not sure what I’m able to do or not in various social groups. Even trying to job hunt into something less abusive and exhausting. I even feel there’s more to my health than I realize that’s causing me to feel this…… painfully exhausted. But enough of that, it sounds like whining so let’s move onto the other points of thoughts. Even not sure if people reading this shall take it the wrong way or not. I truly want to go back out taking pictures of Busou Shinki, Frame Arms Girl, as well as Varakitsu. Not just indoors, but outdoors also. It’s so much easier going out taking images of Busou Shinkis & FA: Girls because of their scale, even with various forms of cameras. You can do a lot with them because of how you can carry them with you in your pocket, or similar. Varakitsu is so much harder because not much scales with her in my area.I constantly struggle with Vara, even a bit ‘professionally’ envious of other people’s higher quality images, wondering if my Vara images are even that enjoyable. I’ve also had plans for summoning various Dollfies, yet had to put a hold on that. It’s still possible, yet on hold. I may, depending on interest, come back to desiring Esdese Dollfie when I settle myself out some more. I have quite a backlog to get to, something I’m hoping to tackle appropriately soon. Wanting to tackle ‘Nendo Yuudachi’, ‘Nendo Kiso’, as well as Figma Caster Fox when I’m not painfully exhausted. I even have a Frame Arms Girl [MSG] KanColle inspired weaponry I have yet to review. I really want to get on top of that ASAP! I was supposed to already be on a Kiso review, yet may be typing what may be considered a ‘whining’ blog post that could have been either a Yuudachi or Kiso blog posting instead. Shortly after this blog post I’m going to try posting a Canada Day related blog posting with both figure photography, as well as gaming related Canadian pride for Canada’s 150th birthday. Hoping you’ll look forward to that. I’m trying to push heavily for releasing a Canada Day related blog posting on the ‘fun side of things’. Granted, we’ll see how my health holds on, and if my ‘painful exhaustion’ shall be eased away or not. I guess I have no images to share for this point, yet I’ll have something posted on, or after July 1st. ‘Notice me Senpai, ISIS’ is also going around throwing childish tantrums saying they’ll also attack Canada on Canada Day that it’s making me facepalm with how attention-whory ISIS all because a Canadian sniper set a new world record. ISIS being all childish that it’s both hilarious an pathetic, suitable with that ‘notice me senpai’ anime yandere meme for seeking constant attention. It’s complicating some simple plans of figure photography because there’s this slight threat that ISIS is being their typical brainless selves, envious & jealous that they have to ruin other people’s lives. Even so, with that threat being viewed in a hilarious way, I’ll see about posting something for Canada Day. Pardon the politics, yet just wanted to note a slight complication to what’s up. Also posted that KanColle Gangut above because it’s one thing that makes me happy from KanColle. RNG was idiotic, yet the reward was worth it. I’m happy to have spent as much as I have in KanColle that I’ll keep playing it. For Bismarck, Warspite, and Gangut. Even Saratoga and Graf Zeppelin. Yura was someone recently updated, one whom I desired to have seen a remodel Kai Ni of her for the longest time. I’m glad. 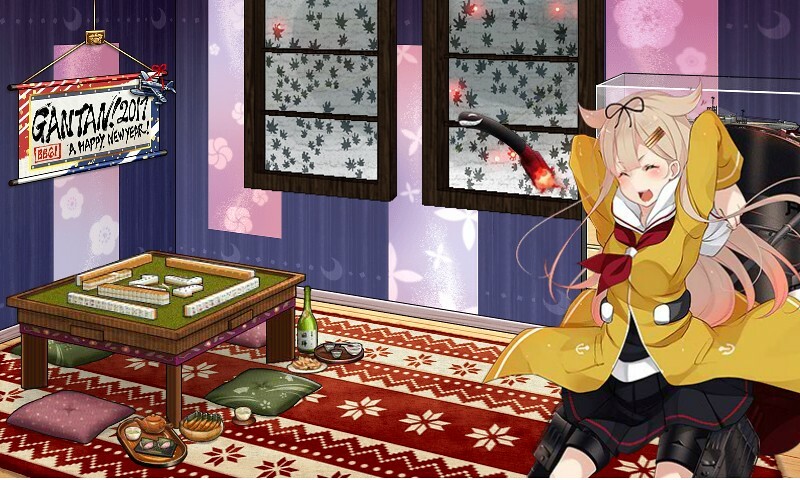 I’m glad both her & Shouhou have been remodeled. Even Suzuya. – The lovely Suzuya having a lovely remodel, something which makes me proud. 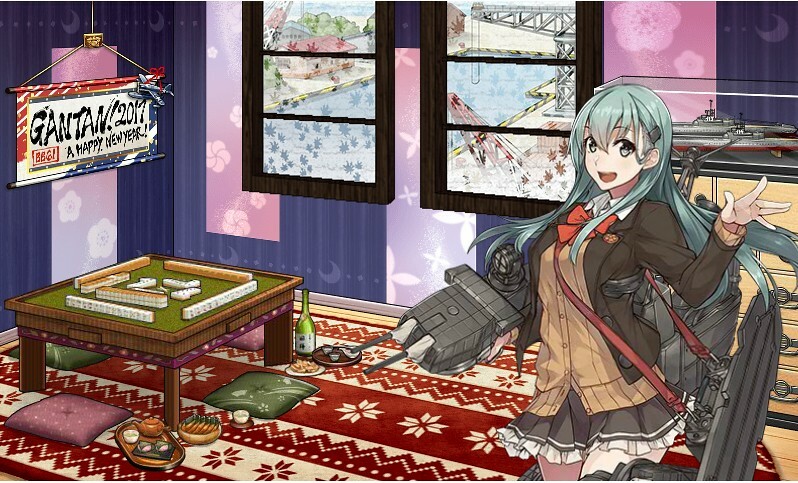 Even Kumano, someone whom I have to level up. Still “try-Harding” so hard with KanColle that I’m still in the middle of regaining lost supplies, yet gradually feeling the need to jump out of that bubble to level my lovelies. Already leveled Ise to level 50 because of a quest, something I have yet to check off. I still want to level up Gangut, and others. I’ll soon be able to, hoping there’ll be no mention of an event soon because of how drained I am all around. That last event ruined me that I just want to relax. I do not want to tweet salty things because that’s how I lose followers, and such. I just want to treat my Kanmusu properly. At one point I did say I’d stop playing KanColle because of my dislike with how the RNG is treated in this game. It constantly denied me to the point even I had to give up on it. I love KanColle, but that RNG ruins it. The ship locking and such that I desire a more free-roamy KanColle game on the level of Silent Hunter 3. I want to order my Kanmusu around similar to how KanColle Arcade is. To see them waltz through the corridor, or something. I don’t find joy in being punished in a game, that’s not what games are for. Games are meant for fun, and they should allow you to have fun. I love gaining new Kanmusu because I’m a collector, yet RNG needs that fine balance, something that scared away my friends & buddies from the game. It’s too harsh on people that it needs more free-roamy options to it. The weather is being all wacky that it keeps shifting from sunny to overcast with ease. It’s like London weather where it’s sunny, cloudy, sunny, cloudy, sunny, cloudy. It messes with your mind. Sunny, snow, sunny, snow, sunny, snow. Swap out both clouds & snow for rain also, or even thunderstorms. Weather is a mess it caused flooding a few months back that we now had crazy ‘Mayfly’ infestations, something that’s out of the unusual. You do see Mayflies, yet not in this frequency. – One of the many Mayflies on the car. They were all over the roof, the windshield, the door, and everything. Insane. You only see one, yet I had to focus on just one for the image. – The were EVERYWHERE. They don’t bite, but they were everywhere. – All over the walls, doors, and such. Camera probably doesn’t show it properly as it tends to skew perspective. They covered lamp posts, and everything. I saw them on store front doors, and other locations as well. They are common, yet not to this degree of infestation. Also, we’ve been having a nice range of thunderstorms that it’s been enjoyable. Even three waves in one day being very severe that you could hear the rain in a workplace, or in a near white out from all the rain. Raining and thundering almost every day that KanColle’s rainy season art seems appropriate for my area also. – Rainy season art of Destroyer Yuudachi. POI! YATTA! Finally have a new phone that I can jump back into F/GO on both the Japan & English side of things. I love my new phone that I can play F/GO again on both sides of things. Mostly my Japanese side while I use the English version more casually. It’s not bad. I can finally understand what’s going on, yet there’s localization issues which tends to hype up those saying ‘Japanese version is better’ type of crowd. I’m also in that crowd that tends to say how special Japanese versions are and that North Americans truly must not voice act because they take things for granted. They treat anime just as a source of income, nothing else. It’s all for fame & income, nothing else. I guess I’ll come across as an elitist, yet someone who loves Anime as much as I do I love sticking with the Japanese side because there’s that passion and the love for art. That love, care, and passion is what makes the original content the best, yet there’s also that part where people in North American can understand the English version. That’s fine also. When coming back to the Japanese version I was surprised to have rolled a lovely ‘Minamoto no Yorimitsu’. She was a great surprise to me when trying to role for Suzuka Gozen. I really want a foxy, or even Tama Neko, yet not being graced by a foxy yet. A tanuki rider, yes [Ushiwakamaru] whom is an interesting tease with her fashion style. I originally disliked Minamoto because of her outrageous proportions. The crazy breast sizes with her body proportions that it’s a turn off. People would even see her as ‘perverted’, or something. Seeing her in action with her fighting style when as a support using other people’s version of her made me appreciate her worth and value more. She’s awesome. She has an interesting style to her, and I actually love her as a servant. With all the EXP cards I had laying about, plus all the quartz I was gifted with, allowed me to both summon her & raise her to a nice level 50. Even ascending her once. I’m so happy to be back with Scathach that I want to continue leveling her up to reach her max ascension. I’m trying to recall what made her my ‘waifu’, assuming that it’s because she’s female, her style, her serious (I seem drawn to serious woman), as well as having an interesting style to her. – Anne Bonny & Merry Read’s Noble Phantasm. I always wanted to screen capture various Noble Phantasms. So happy! Been leveling up my lovely Servants with every bit of EXP card I could get my hands on, even trying to summon Gozen one last time before she vanished in a gacha. The update now bringing another round of Servants, none that catch my eye. Did notice a pirate type, yet doesn’t seem to be summon-able. Even Fate/Apocrypha being celebrating that I can’t wait to watch that. – I’ve gained that card, plus desiring to watch this show heavily. One of the most anticipated. – A lovely Craft Essence to add into the collection. – Apocrypha hype! I also have some of the servants shown in that anime. – FGO The Stage seems to be a live action version performance, or so from what I gathered. Nice art. – EXP bonus for the Master after completing various quests & missions. Well, it’s good to be back! Shall be playing on the Japanese version more while treating the English version more casually. I have Servants on the JP account I need to level and ascend further, something that seems to be a simple thing to do. I just have to get a few items here and there, plus some more EXP cards, and I’ll have higher level Servants. So happy to be back with my lovely Scathach <3. Also, if you poke me via twitter [@ArcticuKitsu] I’ll add you sooner once I’m aware I’m more familiar with you, or something to that effect. I still strongly desire for an actual free-roamy Fate game where you are the master to roam about the world freely with your servant (or many) to do as you wish. Web games can only provide so much that I wish it can be brought into a 3D space. Fate/Extella for ‘Switch’ is something I’m still aiming to get. As noted before, I had to have my main blog touched up because it was falling in a state of disrepair. I had to get the blog updated, plugins updated, as well as finally having the white pages fixed. The blog was a mess, and I was unable to fix it myself. I had to get my site host to fix it. You’re able to view the blog postings, the header pages, as well as being able to comment again to shout at me, curse at me, or leave a kind comment, or whatever. Either that, or just ignore me all together. The choice is yours, yet you should be able to comment again because a rogue plugin (outdated) was disabled. As for me going back to figure photography, that is up to my health to decide. I really want to post more figure related content, yet boring the hell out of people posting mainly KanColle and gaming related content. They followed me for Busou Shinki, Frame Arms Girl content, and etc, yet I failed people because my health is also an issue. Yes, since January onward it’s been at a low, maybe also because I’ve been feeling depressed over certain situations. It be highly stressful and awkward having certain situations mended back to health as I’m now used to being on the other side of the fence. But yeah, blog updated and fixed, you can comment, and I’m trying to remove the blog email because I haven’t used it much. I even failed to reply to people that I’m just getting rid of it. Contact me on Twitter, or leave a comment here because it’s also a security issue with that e-mail. Just a full round of neglect. Thanks for reading. Nothing special this time around, just a semi-worthless blog postings just stating some thoughts while explaining some other stuff. Just saying why I haven’t posted Nendo Yuudachi & Nendo Kiso yet, as well as having a strong desire to really post such. See you in the July 1st posting!